All homes currently listed for sale in the zip code 92660 as of 04/21/2019 are shown below. You can change the search criteria at any time by pressing the 'Change Search' button below. "Priced millions BELOW replacement cost!! This stunning guard gated Cape Cod Estate spans 6,648 s.f on an over 17,000 s.f lot and offers the ULTIMATE entertainers home. Perched on the corner of a generous tree-lined parcel this beautiful traditional style family home is truly one of a kind. Upon entering the gorgeous foyer, your eyes will transition from the interior immediately to the enormous outdoor entertainer s paradise. This gorgeous five bedroom, seven bath home wraps around the sprawling central outdoor living space complete with an expansive pool & spa, stone fireplace, an outdoor kitchen with a built-in barbecue, and a pizza oven creating the ultimate outdoor environment. 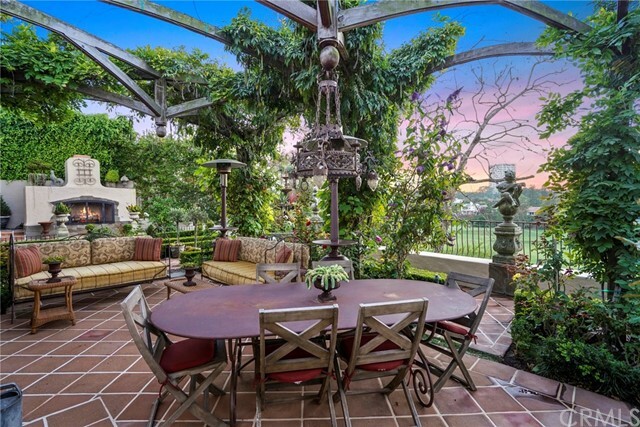 Each room embraces the outdoor space with French doors opening to this entertainers dream. The pool house doubles as a guest house complete with built-in refrigerator, dishwasher, washer & dryer This masterfully built estate offers extraordinary design aesthetic with exquisite custom detailing and finishes in every room including four interior fireplaces, his and hers offices, a gym, a temperature controlled wine cellar and a four car garage. Every detail of this home is planned and designed! 9 Cherry Hills seamlessly integrates indoor/outdoor living. Ideally located in the heart of Newport Beach and Big Canyon Country Club!! Designed by renowned architect Brion Jeannette!! 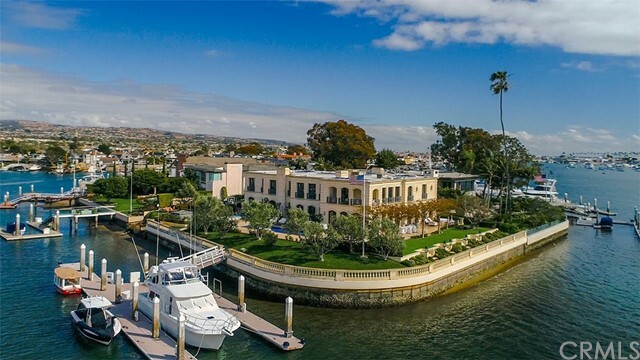 You will not find a better VALUE & PRICE in Newport Beach"
"Revel in the beauty of a rising sun over sparkling waters from this south-facing bay front property. 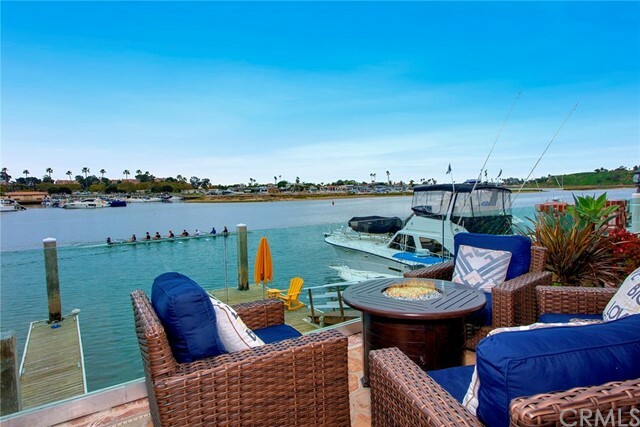 With approximately 60 feet of frontage and a newer private dock with three slips that can accommodate an approximate 60 yacht, a Duffy boat, and another side tie, this residence exemplifies Newport Beach waterfront living. Upon entry, an expansive front courtyard and a two-story foyer with sweeping staircase set the stage for the idyllic home that awaits. 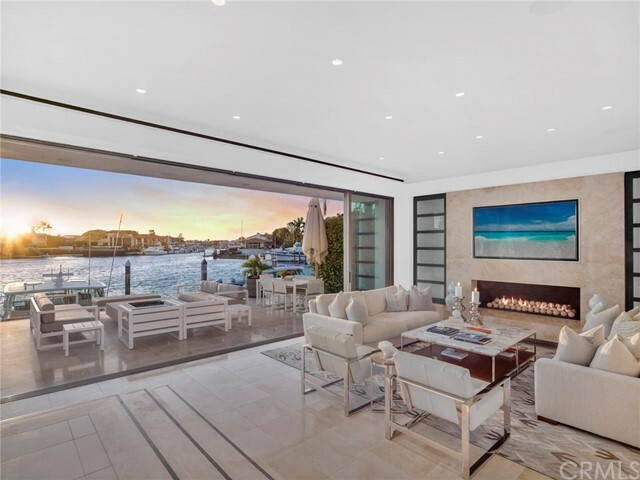 The open flowing floor plan encompasses spacious living and family rooms set against a backdrop of shimmering back bay and harbor activity views; while, the dining room enjoys direct access to the courtyard for inspired indoor-outdoor entertaining. The gourmet kitchen will impress the most discerning chef with beautiful granite counter tops, top-of-the-line appliances, breakfast nook, and access to an adjacent side patio. A total of four bedrooms include a first-floor en suite bedroom ideal for guests, two secondary bedrooms, and a luxurious master suite with incredible views, expansive balcony, and a sumptuous master bath completely renovated to include designer finishes, dual walk-in closets, and oversized shower. Additional highlights of this prominent residence include a new glass patio railing, second-level loft space ideal for an office or media center, three-car garage, and an unparalleled location in Dover Shores close to parks, schools, Westcliff shopping and restaurants, plus access to three private beaches." "Located in Newport Beaches BEST view oriented neighborhood, 11 Crestwood Dr.in Harbor Ridge is a 24 hour guard gated community with open spaces ,tennis courts,pools and some of the BEST views imaginable . Awaiting is the extraordinary opportunity with 6800 SF of living space, 6 bedroom 6 bath home with a private courtyard pool/spa , front /rear decks that flow seamlessly , transitioning into a soft contemporary home providing an optimal living lifestyle .The homes orientation is set to maximize the panoramic views and not disappoint from the wide open Pacific Ocean to downtown LA, the live view frame captures stunning sit down views of Newport Harbor, sunsets over Catalina all year long,Fashion Island,City Lights, LA & Long Beach harbors, whitewater, Beaches from NB to the Palos Verde peninsula and as far as your eye can see. This home would be difficult to duplicate due to its existing SF and lot size ,this is truly a one of kind opportunity to create a vision with Chris Light that is optimal to anything.The location is centralized to everything the city offers ,walk to the Corona Del Mar village,World renowned Fashion Island shopping and restaurants , close access to all schools and easy access to the highways. Conceptual design and floor plans are available by renowned Architect Chris Light and Associates ." 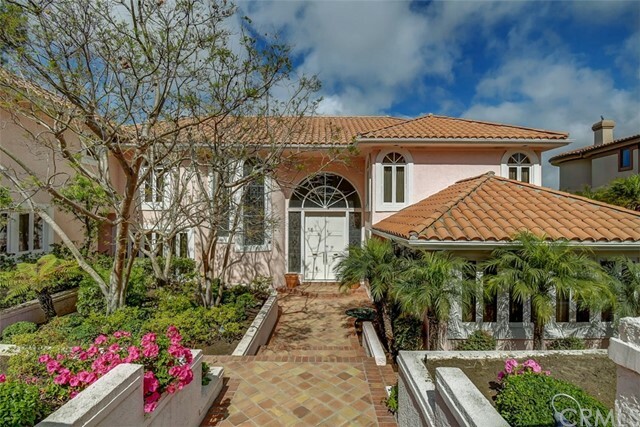 "This estate has panoramic views from the gated Harbor Ridge community. 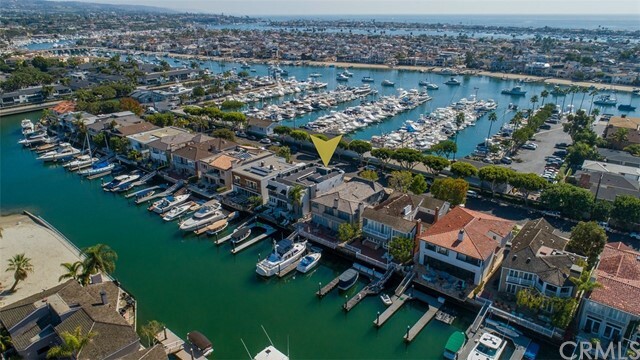 29 Ridgeline presents an incredibly rare opportunity to own one of the best view homes in all of Newport Beach. The moment you enter the two story foyer you are captivated by the views to the coastline, with stunning views from Catalina to the mountains, up the coast to Los Angeles. This estate spans 7,500 +/- square feet, on a sprawling 12,650 +/- square foot lot. The home boasts 6 bedrooms plus a full maid s quarters, 7 baths, with ample entertaining area both inside and out from the patio and pool area. Making this incredible property even more unique is the opportunity to remodel it to the home of your dreams. Harbor Ridge offers 24-hour guard-gated security, with close proximity to world class dining, shopping and entertainment. Minutes to John Wayne Airport. A Designer's Dream!!" "Contemporary Bay Front Home located towards the end of Harbor Island Dr on Promontory Bay. Architecturally designed to captivate the open indoor/outdoor living area with water views from nearly every room in this modern designed home. Panoramic doors open to an expansive outdoor terrace with two 50 ft boat docks and a Duffy side-tie. Other than a main floor bedroom with private patio and French doors, the entire downstairs is a great room featuring an enormous gourmet kitchen with an extra large center island, Viking appliances, 6 burner stove and abundant amount of Quartz counters, formal dining, separate wet-bar and step down living room. The master bedroom suite boasts a large retreat area, a contemporary mounted fireplace, built in cabinetry, a steam spa shower, walk-in closet, and a private terrace with an awesome view of the bay and city lights. There is also an additional private rooftop entertaining deck with water views off of a secondary bedroom/exercise room. All bedrooms include en-suite bathrooms. 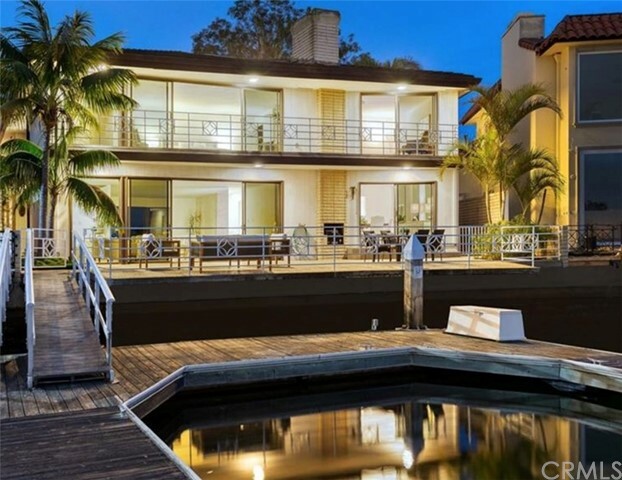 Absolutely the finest contemporary water front home in Newport Beach!" "Reimagined, redesigned, and newly renovated. 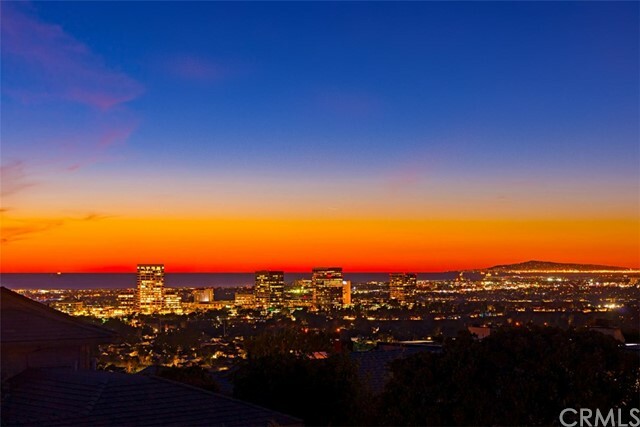 Savor glistening Ocean and Harbor views throughout by day before being captivated with a dazzling array of nighttime city-lights that embellish the Orange County and LA coastlines with brilliance. This front-row, custom estate situated behind Newport Beach s illustrious community of Harbor Ridge boasts nearly 6,650 sq ft of completely remodeled living space accompanied by 5 bedrooms and 7.5 baths that are complemented by an open floor plan which creates seamless transitions between the formal living space, dining room, and kitchen. French oak floors, Italian marble countertops, and designer lighting fixtures blend together to create a truly transitional interior living experience. and Three en-suite bedrooms, including the lavishly appointed master, dual-walk in closets, and dual bathrooms complete the upstairs, while the subterranean level is highlighted by a generously sized in-laws unit complete with its own living room and romantic fireplace. An impressive media room and massage parlor supplement the area to create an ideal balance of leisure and relaxation. 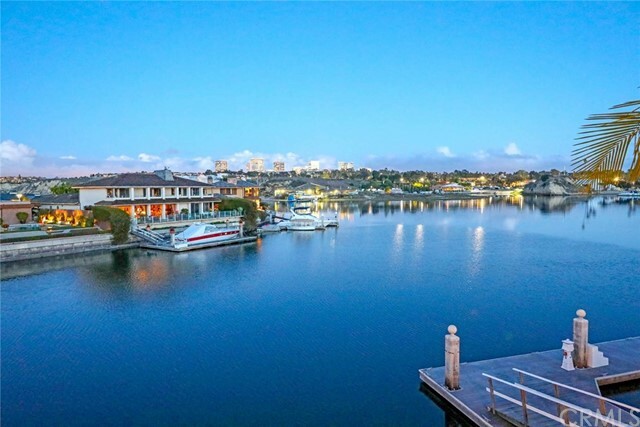 9 Narbonne epitomizes chic, coastal lifestyle at its finest. 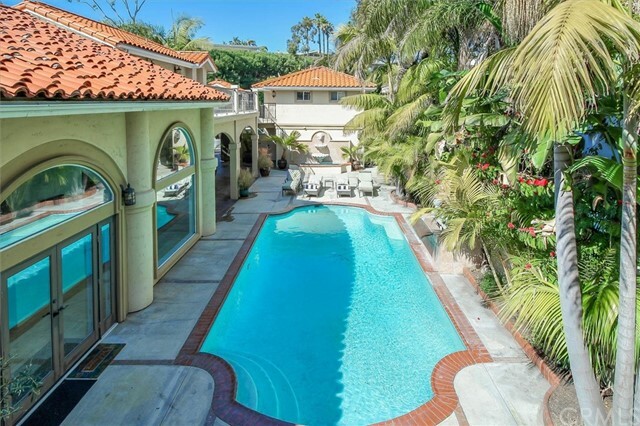 Immediate proximity to world class shopping at Fashion Island & South Coast Plaza, award winning schools, and resort style beaches complete this estate." 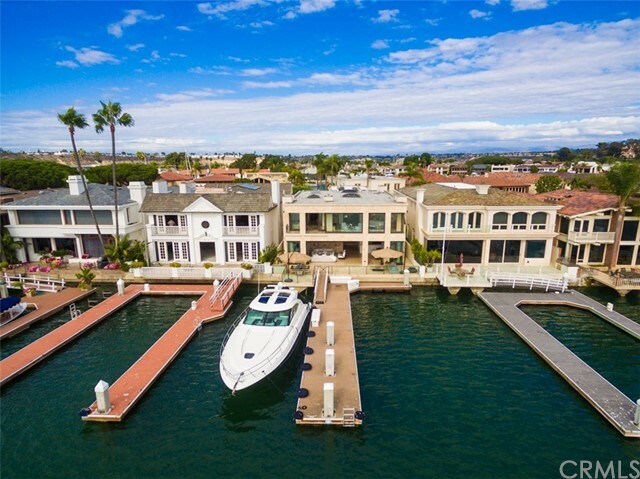 "Welcome to Harbor Ridge- a collection of unique homes with some of the best views in Newport Beach ! Imagine a 5 bedroom 5 1/2 bath home with a resort-like backyard, complete with pool , spa, a BBQ pavilion- and fireplace- Can't you just imagine yourself lounging or entertaining with friends & family ? By day- this home has the traditional social spaces to be lived in... living room- kitchen-dining room-office- bedrooms. Then add a vaulted , beamed ceiling great-room ( theater room?) dressed in rich dark woods serviced by your own pub-like bar. The master suite is romantic, expansive and inviting. Lower level has 3 car garage, 1 bedroom & bath ( used as a gym) and the laundry room. SHOWTIME... Welcome to your own club after experiencing another glorious sunset. Watch movies from plush sofa chairs or enjoy spirited conversations at the bar. Share special wines kept in your own wine room. Move the party outside onto the view deck bathed in the warm glow from the fire pits. Heat lamps keep it toasty while the steaks are sizzling on the nearby BBQ. Whether by day or night 2 Yorkshire is ONE unique property. Hope to see you soon. Buyer is advised to independently verify the accuracy of all information through personal inspection & w/ appropriate professionals to satisfy themselves." 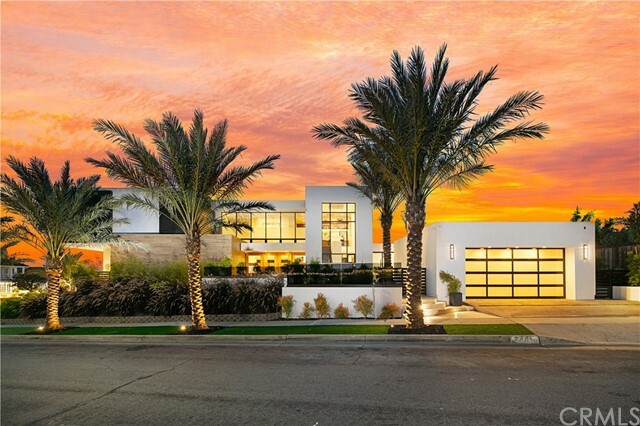 "Chic, modern and ultra-contemporary, this brand-new custom estate in Newport Beach s preferred East Bluff community is ready to add Hollywood Hills-style glamour and sophistication to your lifestyle. Phenomenal ocean, sunset and Catalina Island views from both levels enrich the stellar residence, which has just been completed and features state-of-the-art construction, amenities and systems. The line between indoor and outdoor living is virtually indistinguishable, thanks to an abundance of floor-to-ceiling windows, and slide-away glass doors that open an entire corner of the lower level to the backyard. This area of the home is complete with a sitting area, dining room, and a great room. A magazine-worthy kitchen opens to the grand living space and hosts stone countertops, a dining peninsula, custom cabinetry and high-end stainless steel appliances. Approx. 5,000 s.f., the designer showcase is home to 5 bedrooms, 5.5 baths, and a loft office retreat. Enjoy breathtaking vistas from your master suite, where two sides feature floor-to-ceiling windows, and an outdoor deck and indoor retreat make it easy to relax. The master bath is stunning, incorporating natural stone and wood into an open space with dual sinks, a large tub, shower and sit-down vanity." "A gorgeous modern style residence of Meridian community located in Newport Beach next to the Marriott Hotel in Fashion Island. This unique 2,817 square foot home features 3 elegant bedrooms, 3 full bathrooms, and a gourmet kitchen with top-of-line appliances which opens up to fabulous family room featuring amazingly beautiful golf course views of Newport Beach Country Club, city lights, and Ocean views. This stunning home offers eco-friendly and energy efficient amenities including a smart home system . The community pool, spa, overlook lounge, club room, fitness center, and barbeque allow you a respite, a place to savor the finest amenities and enjoy the prestigious community. As a resident, you can access your unit directly from the secured subterranean garage with private elevator, 2 private and secured parking spaces, a private storage unit, and 24 HR concierge service. Few minutes walk to world class shopping, dining, and entertainment." "This is the most unique and desirable location in the Meridian in Newport Center. This highly upgraded, never-lived-in, single-level residence occupies the singular position that affords these sweeping fairway and ocean views - as well as entry and exit without use of an elevator. The clean, light and sophisticated interiors include designer finishes and upgrades throughout. The corner location (again quite rare for this community) is flooded with light and ocean breezes, and opens to views on three sides. Substantial improvements include hand-finished white oak floors, imported Carrara marble, custom automated window coverings, whole-house A/V-Lutron-Sonos installations, an upgraded kitchen with SubZero wine refrigerator and Wolfe range, a redesigned marble-lined master bath with Toto commodes, and many other fine appointments. The oversize terrace complements the spacious main entertaining areas and Great Room which it adjoins and opens to through retractable walls of glass. The Meridian also provides 24-hour secured access and concierge services. For those who desire a pristine new residence with the convenience of such a setting, yet do not want to sacrifice the livability of walk-in, walk-out access to all the amenities of Newport Center and Fashion Island (across the street), this rare opportunity is not to be missed." 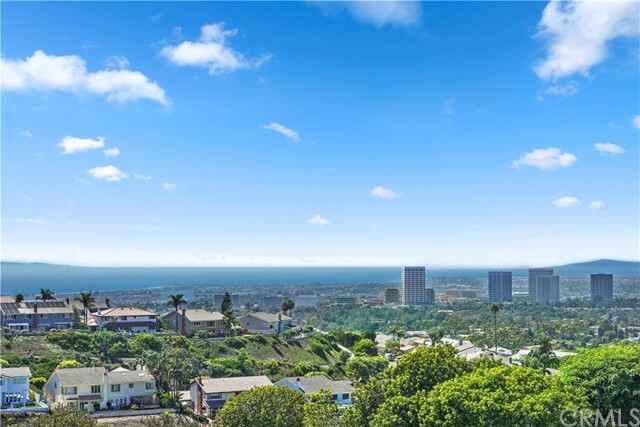 "Perched above the Newport Country Club golf course with back bay, ocean and Catalina views, this pristine contemporary penthouse offers upscale hotel-style living with 5-star amenities, turn-key accommodations and a highly-desirable location mere moments to Fashion Island. 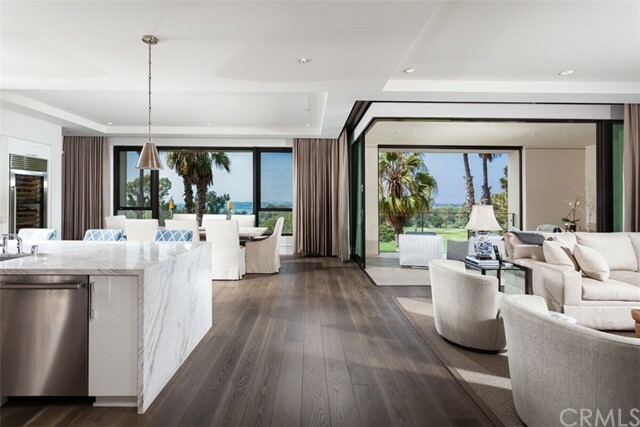 Completed in 2015, the residence showcases swanky high-end finishes including Warren Christopher French oak flooring, oversized windows with custom motorized coverings, Calacatta marble, quartz and stone accents. An open-concept floor plan allows panoramic views from nearly every space while stackable glass doors marry the spacious great room with a covered terrace for effortless living and entertaining alike. Fit with state-of-the-art Wolf range, SubZero, and Bosch appliances including dual-temperature controlled wine storage, the gourmet kitchen accommodates the needs of the culinary enthusiast or your personal chef. The spacious master suite is equally impressive boasting stunning views and en suite bath replete with soaking tub, oversized shower, dual sinks and separate water closet. SMART home technology, sleek linear registers, appx. 60 sq. ft. storage unit, and two en suite bedrooms, each with a unique vantage point, are additional highlights. Exemplary community amenities including 24-hour on-site concierge service, pool, spa, outdoor lounge, club room, fitness center and BBQ area make this a unique opportunity to enjoy the ease of luxe hotel-style living in an exclusive coastal-urban setting." 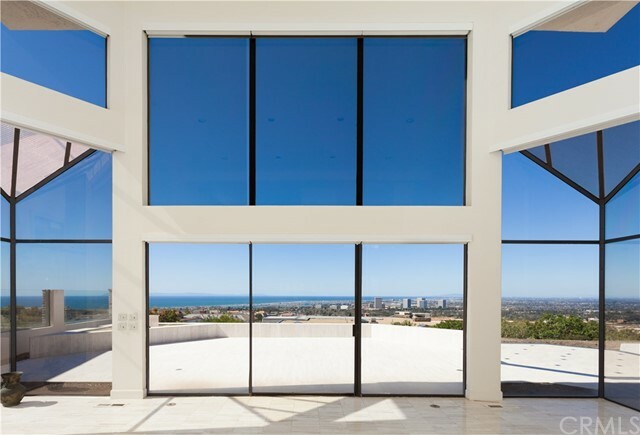 "Upon entrance to this sleek contemporary home in The Meridian you're captivated by front-row golf course views, Catalina Island and ocean views through the expansive sliding glass walls. As one of the most sought after floor plans, this special residence is offered fully furnished and highlights open interiors flooded with natural light. The professionally designed interiors display high end upgrades inclusive of an entertainers kitchen, white lacquer cabinetry, spa-inspired baths, custom hardwood floors, automated window coverings, custom built-ins and home automation system- A/V system. The great room's living and dining areas meld indoor elegance with outdoor splendor. 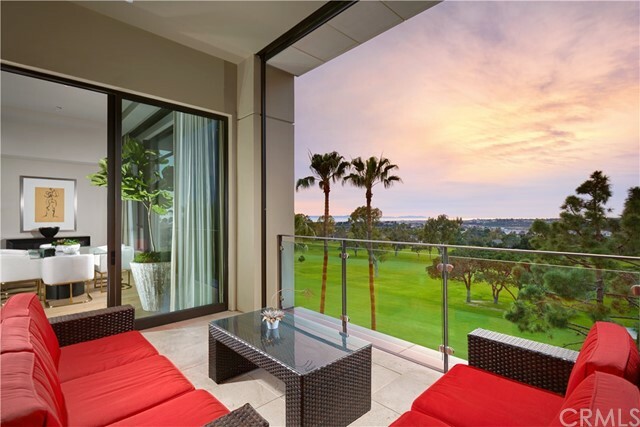 One can enjoy the terrace overlooking the golf course and beautiful sunset views. The kitchen features an oversized island and exquisite appliances. The grand master suite offers a place to relax while the second suite is bright and also offers tranquil views. Unique to the Meridian, is this residence's ideal location at the end of the group of residence towers providing an ideal insulated position from surrounding noise impacts. The Meridian remains the jewel of the Newport Center and offers an on-site Concierge service, fitness center, indoor and outdoor entertaining areas, club room, pool, gated entry and secure parking. Enjoy a luxe lifestyle and notable amenities all within a short walk to Fashion Island shops, restaurants and exciting beach cities. The Meridian is truly a special destination." "Perched high amongst the treetops in a serene picturesque setting with city lights as the backdrop, this custom Big Canyon estate offers elegant yet very comfortable interior finishes, tremendous curb appeal, and is located at the end of a quiet cul-de-sac offering privacy and seclusion as if in a world of its own. Recent renovations of this four bedroom plus office and media room home include new hickory wood flooring, new paint and chef s kitchen with Ceasarstone countertops and a large center island with prep sink. The formal living room and dining room boast incredible vistas of the stunning and incredibly charming backyard and driving range beyond. The second level is comprised solely of a massive office, lined with handsome wood paneling and hand tooled Cherry wood parchet flooring, and a master suite with dual vanities, jetted spa like tub and dual room walk-in closet. Perfect for entertaining, the backyard features gorgeous English gardens, cozy fireplace, and multiple seating and dining areas. A front courtyard is the center of this gorgeous property and offers additional entertaining space, large salt water pool and mature meticulously maintained landscaping. 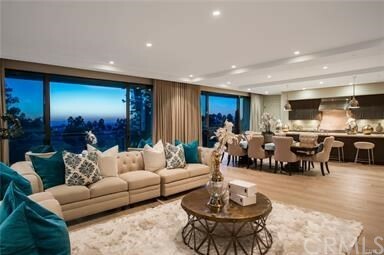 Within walking distance of Fashion Island, this exquisite home in prestigious and guard gated Big Canyon is not to be missed."